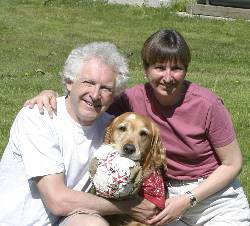 Travels of the Agnew Family in the "Dog House" 2006-2007: Did you know you could drink Aloe Vera? Did you know you could drink Aloe Vera? 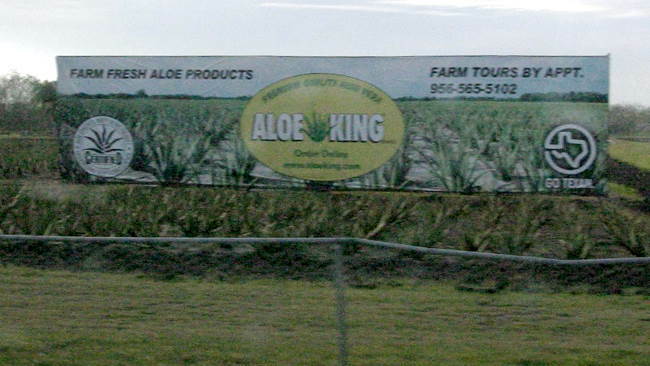 We skipped Spanish class today and joined a number of people from our RV park for a tour of Aloe King an aloe farm in Mercedes about ½ hour from the park. Did you know you can drink the liquid from Aloe Vera (some people claim it helps some health problems) or add it to the pot when you cook beans to eliminate gas when the beans are consumed or marinate meat in it to tenderize the meat? I know I only thought of Aloe Vera as agent in skin products to help moisture the skin or help to heal cuts or burns. During the tour we were given a sample of freshly filleted aloe vera to taste as well as some juice. It tasted at bit too much like medicine for my liking. The naturalist at Bentsen State Park also runs a night program so we decided to check it out. We headed out at sunset to see what night creatures we might see. Javelina, raccoons and Screech Owls were spotted. 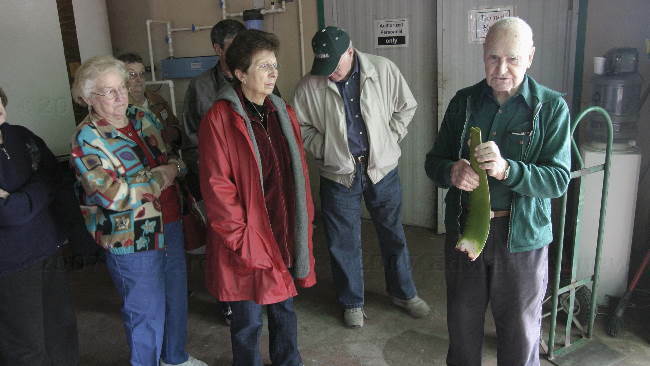 The father of the owner is explaining the harvesting process of Aloe Vera. 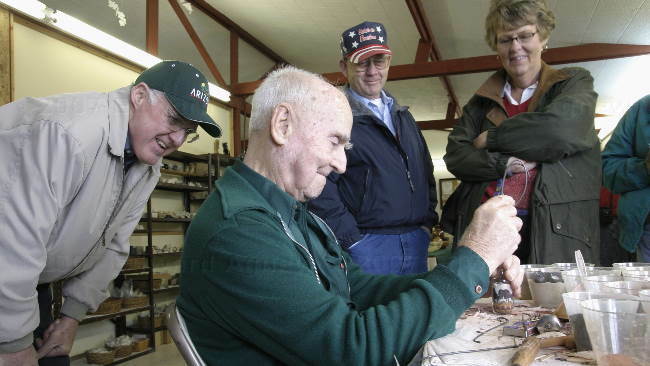 The 80 something year old father of the Aloe farm owner does sand art. 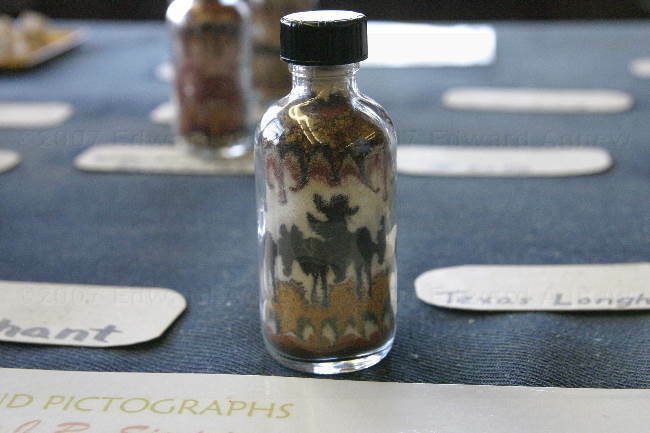 We watched as you pour sand into the jar and pushed it around to make the designs. The finished product --- a cowboy on a horse. 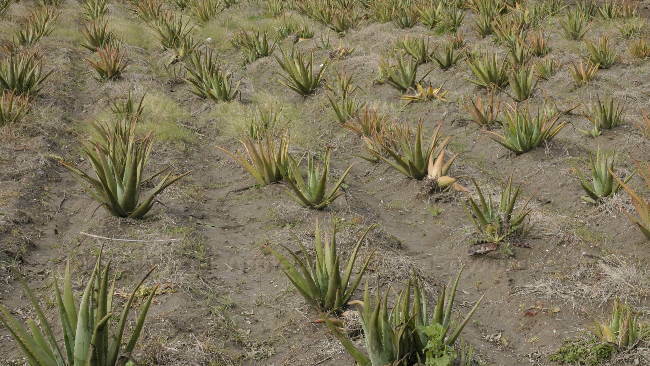 A field of Aloe Vera.